Want to guarantee your ride? Book online quickly and easily. Cable 2 has arrived! This cable runs at a slower speed of 25km/hr*. Need some pointers? The operators and dock hands are trained to help you learn how to wakeboard! Ready to start? Check out the ticket options here tailored to first-timers. *Please note, running times of Cable 2 may vary depending on demand and season. With a lifetime of experience on the water, GC Wake Park founder Daniel Watkins has hand-picked an amazing selection of obstacles for the park specifically laid out to offer hundreds of lines to hit. It would take months to fully master the whole park! Bring your own equipment and (without fins) hit all the obstacles the park has to offer, or if you are traveling we have you covered with top of the range Slingshot and Ripcurl rental equipment to make you feel right at home as soon as you leave the dock. Our most popular pass for experienced riders is the 4-hour pass – giving you plenty of time on the water – because once you start you’ll be hooked and never want to leave! Family packages are available for 2-hour and 4-hour passes. This is a great way for the family to spend time together on the water enjoying wakeboarding, kneeboard or skiing. We suggest this option for a full day of family fun for 4 people, including 2 Adults and 2 Children. KIDS CLUB: Kids Club runs every Saturday and Sunday from 8:30am – 10am. The cable runs at a slower speed to help the kids who are just beginning to get around the corners easier. For those who have wakeboarded before, the slower speed also helps them to take on the floating obstacles for the first time. During Kids Club, extra coaches are on hand to support new young riders. 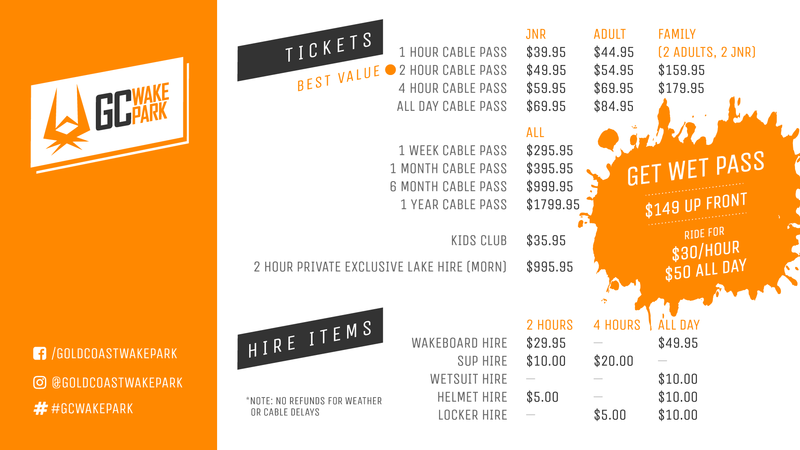 NORMAL TIMES: During our normal hours we offer wakeboarding and kneeboarding for first timers. Our friendly staff will be on hand to help you through every step of the way. See all passes recommended for kids here.